The UK’s top champions of learning outside the classroom (LOtC) were rewarded at the annual Awards for Outstanding Contribution to LOtC, which took place in Essex on Thursday 26th November. Four awards were handed out in total, at the ceremony held at Gilwell Park Scout Activity Centre near Epping Forest. The accolade for LOtC Advocate was won by Ellie Henderson, Education Centre Manager for Anglian Water’s Chelmsford Water Recycling Centre. The award recognised the time Ellie has spent at the centre creating a stimulating, safe, exciting and challenging environment that promotes sustainability and learning outside the classroom. Runners up for this prize included Tania Orgill from Playwood Forest Schools, Catherine Talbot Landers from the University of Edge Hill and Sue Waite, professor of education at the University of Plymouth. The award for LOtC Innovator was given to Simon Poote, a foundation stage teacher from Long Crendon School in Buckinghamshire. Starting with a flat lawn and no money, Simon used recycled materials to landscape and equip an inspirational learning area which has been praised for its impact on learning. Runners up were Gary Meek from Challenge and Adventure, Jeanne O’Keefe from Oxclose Nursery in Durham, and Roger Parkinson from the Woodland Trust. The title of LOtC Inspiring Educator went to Nick Hastings, head stockperson at Walby Farm Park. Nick’s workload and activities are varied: he can be found working with Family Literacy and Numeracy groups; reading What the Ladybird Heard by Julia Donaldson to a school group; guiding Live Nativity groups during Christmas events; and involving all children in practical activities where possible, making visits interactive and fun. LOtC Coordinator Leila Atkins from Castle Wood School was a runner up, alongside Dennis Concannon from The Canterbury Centre Pupil Health Referral Unit and Stephanie Thorlby, an Outdoor Instructor at Sayers Croft. The final award of the night was the LOtC Lifetime Achievement award, which was given to Martin Stevenson Birse, farm manager at Pitgaveny Farms. 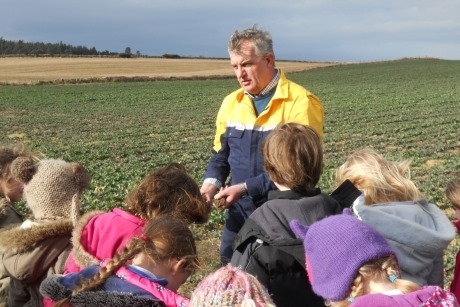 Martin has made a huge contribution to helping educate children about food and farming, particularly through his work with the Royal Northern Countryside Initiative (RNCI), an educational charity which aims to help children and their teachers in the North-East of Scotland develop a greater understanding of farming and the working countryside. For more information about the winners and finalists visit www.lotc.org.uk.